This poker lesson was made for beginning players to Texas Hold’em. 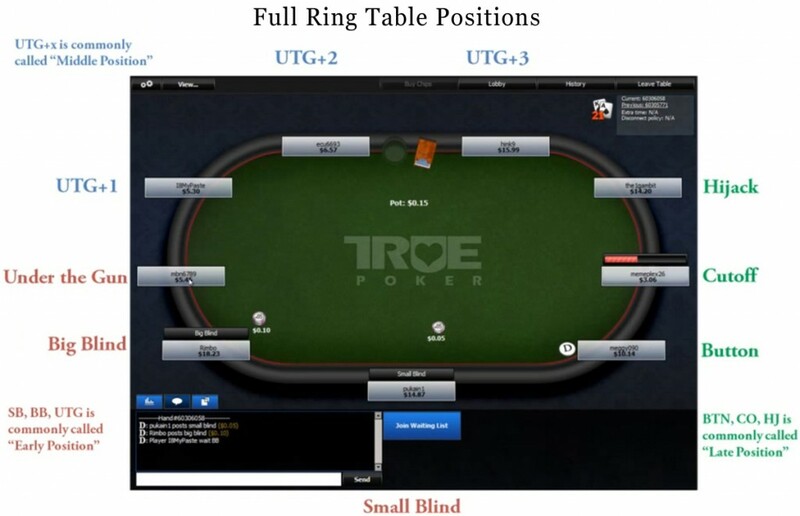 I review the different table positions in a short handed, full ring, and heads up game and explain which of them are considered early, middle, and late position. I also rank the best and worst table positions, while giving a detailed description of the strengths and weaknesses of each position. If you enjoy this video and want to know about new releases, please sign up for the newsletter or subscribe to the PokerTrikz YouTube channel. A full ring game is what most people play during live and online tournaments or when they play live cash games at a casino or with friends. These full ring tables will normally seat 9 or 10 people and this will obviously increase the number of hands dealt every round. There are six unique table positions and a generic modifier you can use when referencing a player at a full ring table. A short handed game will only have five or six players at a table. This creates a much faster paced game and allows people to play a wider range of hands than normal. 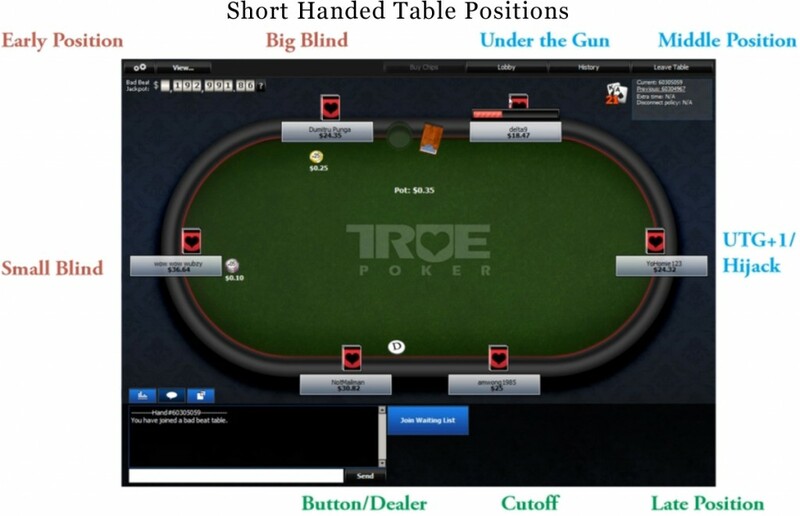 There are only six table positions you need to remember in order to discuss a short handed game. If you are only playing a 5-max game that is popular on some European sites, they you can ignore the Hijack position. A heads up poker table is just a battle between two players. This is the most aggressive and highest variance form of Texas Hold’em that you can play. The table positions of the small and big blinds change when playing heads up, so pay attention. In heads up poker, the dealer is the small blind and the other player will be the big blind. This is to prevent the button from having too much power both preflop and postflop during every hand. 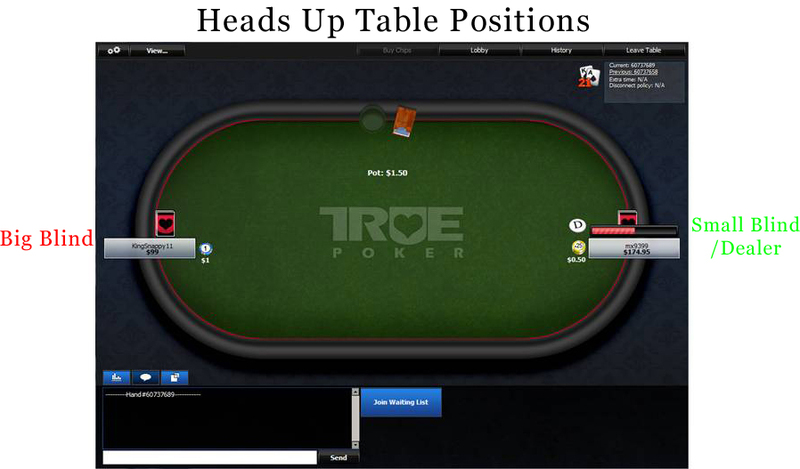 There are only two positions you need to remember to discuss a hand of heads up poker. 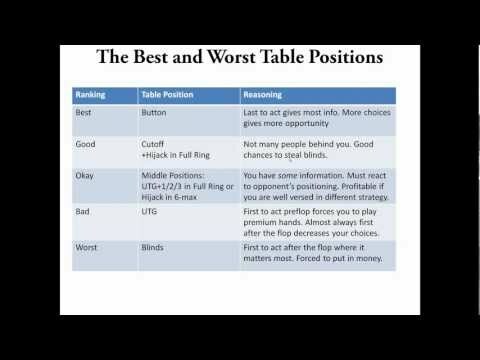 I quickly rank the best and worse table positions and describe why for about 10 minutes in the video. While I was able to cover the basics, the concepts all go much further. In many of my recorded play sessions you will constantly hear me talking about the power of the button and my ability to play more hands and take different lines because I have more information. I am also frequently bemoaning the times I must play from the blinds or out of position versus my opponent in general. Many beginning players do not realize that being in the blinds is actually a humongous disadvantage and even the best players in the world are likely to lose money when they play from the blinds. New players also haven’t realized that the button is their best friend and will win them more money than any other position during their poker career. Next time you see him, give that button a hug; he deserves it. Best Button Last to act gives most you the most information. More choices equals more opportunity. +Hijack in Full Ring Not many left to act people behind you. Present a lot of good chances to steal the blinds. Hijack in Short Handed Little to no information. Must react to opponent’s position. Profitable if you are well versed in different strategy. Bad Under the Gun First to act preflop and almost always postflop forces you to play premium hands and decreases your choices. Worst Blinds First to act after the flop where it matters most. Forced to put in money with every type of hand. Ready to play online poker? I recommend one of these free bankrolls to get started. If you are ready to get started playing online poker, I can honestly recommend one of these free bankroll offers from YourPokerCash. By signing up with them, you can get a free, no-deposit required bankroll at your choice of a few poker rooms. This can help you start your online career for no money upfront, but you have to take it seriously. These free bankroll offers range from $25-$150, but this is only enough to play the smallest stakes. You will have to study the other videos and articles on PokerTrikz in order to improve build your bankroll and move up in limits safely. There is about a 10 minute sign up process at YourPokerCash.com and it requires taking a picture of your ID to prove you are not signing up for the same offer multiple times. Don’t worry, you are allowed cover up your important information. I have personally worked with the team at YourPokerCash for almost 5 years now and they are the same people that have helped me pay out almost $1,000,000 to members in our PokerTrikz rakeback section. There has never been missing payments to PokerTrikz members or myself* and there has never been a support request go unsolved. *Yes, I do get paid for referrals. This means I have already given them much more personal information than just a picture of my ID. I have been out to their offices in Minneapolis and they are a great group of people that I know will take care of PokerTrikz members.